Visually portrays the story of the pivotal battle of Midway and how it turned the tide in the Pacific War. After the attack on Pearl Harbor the U. S. Pacific Fleet was bent but not broken. The fact that the fleet's aircraft carriers were away from base at the time of the attack helped the navy under new commander Admiral Chester Nimitz react to further Japanese expansion in the Pacific. American task forces staged a series of raids, mostly ineffective except in letting the Japanese know that their continued aggression would not go unchecked. Then came the Battle of Coral Sea, the first naval battle fought entirely in air to sea actions - the opposing ships never saw each other. Through experience gained in this battle and advances in code breaking by U. S. Navy cryptologists, the Pacific Fleet was ready for Japan's attack on the American base on Midway on June 5, 1942. Navy fliers attacked the Japanese carriers and sunk four of the six present. And while America lost some ships as well, the two-day battle so damaged the Combined Fleet that the Japanese were never able to mount another strategic offensive in the Pacific. 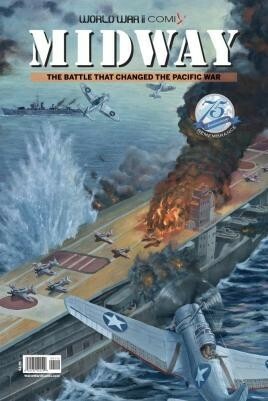 All the preparations, actions, personalities and results of the Battle of Midway are chronicled in graphic story form in Midway - The Battle That Changed the Pacific War. I always found that one of the finest ways to teach history was through the use of pictures and picture strip stories like I used to read every week in my comics. This brilliant account of the Battle of Midway does just that. This is certainly an innovative approach to military history, and conveys a tense excitement of blow and counter-blow.